January Eurozone industrial production was not as disappointing as it seems. Production did fall by -0.1% in January compared to December, confounding expectations of a modest increase. To soothe the pain however, previous months were revised upward. As a consequence, year-on-year growth of industrial production was actually much better than expected at 1.2% compared to a consensus of only 0.1%. Production of intermediate goods was especially weak, falling -0.5%MoM and gaining only 0.7% on the year. Consumer durables production fell -2.2%MoM, but this comes after two strong months, and consumer durables production still shows a healthy year-on-year growth of 2.5%. Looking at developments in major member states, Italy stands out with a -0.7%MoM/-2.2%YoY fall in production. This underlines that Greece may be the Eurozoneâ€™s acute political problem, but Italy remains its long-term economic one. Perhaps surprisingly, Germany also looks weak, with production stagnating compared to December and only gaining 1.0% on the year. Although German manufacturers are first in line to benefit from the weaker euro, it has not yet showed up in increasing production. It is not often that France is doing better than its big neighbour, but today it is: French production rose 0.4%MoM and 1.6%YoY. Spain saw modest improvements of 0.2%MoM/0.6%YoY. Looking ahead, sentiment indicators suggest that February was only slightly better for Eurozone manufacturers than January. In the remainder of the year however, the slide of the euro should increasingly support European export-oriented industries. Moreover, corporates can now borrow at bargain rates thanks to the ECBâ€™s quantitative easing. 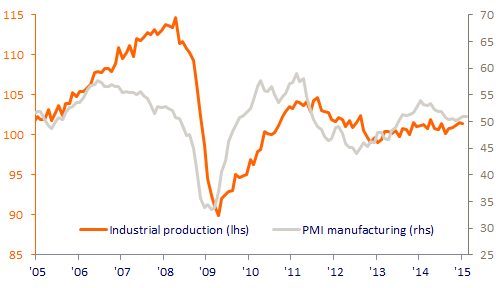 The outlook for manufacturers, and the Eurozone economy in general, is brightening.